Featured illustration by Emily Pidgeon/TED. At home one night earlier this month, I prepared a salad with simulated chicken made from pea and soy proteins. Later I had some cheese derived from almond milk, which I came across, in a testament to its verisimilitude, next to the dairy camemberts and bries at Whole Foods, rather than shelved with the vegan products. On offer nearby was a mayonnaise also based on pea protein. Soon, these products could be joined by two others in development: a milk intended to be produced in part by yeast, and chips made of meat grown in a medium. In thinking about these items, it was sometimes difficult for me to determine the extent to which they share in the essential nature of the foods they emulate. What is the quotient of cheeseness in the nut cheese, or of milkness in the yeast milk? And, for that matter, how should that essence be defined in the first place? At one point the foods involved — chicken, pea, milk, almond — struck me as merely variations on some fundamental substrate of nutrients, and the names became a hazy and untethered assortment of signifiers. AT ONE POINT THE FOODS INVOLVED — CHICKEN, PEA, MILK, ALMOND — STRUCK ME AS MERELY VARIATIONS ON SOME FUNDAMENTAL SUBSTRATE OF NUTRIENTS. Recently there has been growing interest in Silicon Valley and beyond in creating consumer foods that incorporate protein-rich replacements for farm-animal products like meat, dairy foods and eggs. It is a niche already occupied by tofu and soy, but some of the new companies disavow any similarities to them and are encouraging a semantic shift. They are not simply alternatives to animal foods, they say. They are analogs of them, or even new kinds of them. The website of one company, Beyond Meat, puts it like this: “What if you define meat by what it is — amino acids, fats, carbs, minerals, and water — versus where it is from (i.e cows, chickens, pigs)? What you’d have is meat for the future. 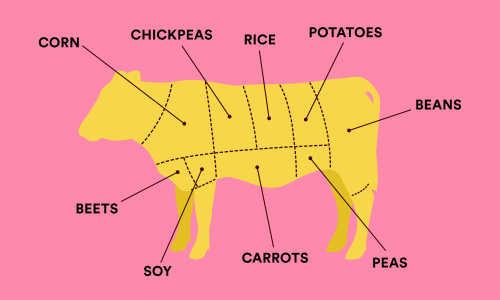 Meat from plants.” In blurring categories like this, however, questions about marketing abound. DEMAND FOR MEAT, PARTICULARLY IN ASIA’S BURGEONING MIDDLE-CLASSES, IS EXPECTED TO SOAR. With the world’s population expected to climb to approach 10 billion by 2050, demand for meat, particularly in Asia’s burgeoning middle classes, is predicted to soar. Meanwhile, the U.N. has reported that raising cattle contributes more greenhouse gases to the atmosphere than does transportation, and that animal products are in general more carbon-intensive than plant-based options. The new food companies often tout their earth-friendly credentials — but they also represent the latest salvo in a lengthy discourse about the human race’s ability to provide for itself as it grows, which Warren Belasco, an American studies professor at the University of Maryland, Baltimore County, ably describes in Meals to Come. THE “CORNUCOPIAN” STRAIN OF THINKING HAS ITS ROOTS IN THE ENLIGHTENMENT. In the 20th century there were rich veins of optimistic, occasionally outlandish, ideas for food innovations. In 1928, the president of the American Chemical Society proclaimed that “thirty men working in a factory the size of a city block can produce in the form of yeast as much food as 1,000 men tilling 57,000 acres.” Winston Churchill imagined rearing chicken parts — breasts or wings — instead of whole animals. A 1949 book called The Coming Age of Wood touted yeast cultured in fermented sawdust. Some of the most grandiose hypothesizing in the 1940s and 1950s involved turning algae into a major food source. Collier’s magazine ran a story that envisioned enormous assemblages of transparent pipes in sunny seaside locations, such as the Gulf of Mexico or the Sea of Galilee. Algae would grow inside them, taking the form of butter or animal fodder. WINSTON CHURCHILL IMAGINED REARING CHICKEN PARTS — BREASTS OR WINGS — INSTEAD OF WHOLE ANIMALS. It is worth noting that many actual technological upheavals in the modern food industry have been of a different variety, often to do with preservation and storage. Iceberg lettuce became “the first industrial vegetable” in the early 20th century, says Gabriella Petrick, an associate professor in the department of nutrition and food studies at George Mason University, thanks partly to ice-producing facilities, which meant the lettuce could be kept cold, transported across the country from California and consumed out of season in its destinations. (Britain’s Royal Society named refrigeration as the most important food innovation in history.) In another development, canned goods were the first mass-produced foods, notes Petrick. Today the question is whether the companies advocating the replacement of animals in the food chain will trigger an upheaval on the scale of refrigeration or canning, or if it is a shift only of interest to a limited segment – vegans, perhaps, and the health-conscious. The foods may win some popularity based on the idea that they are better for the environment, as they necessitate fewer greenhouse-gas emissions. They appeal to our sense of logic. But then, consider bugs. As University of the Pacific food historian Ken Albala notes, “there’s always been this idea that we should eat insects,” which are considered a more eco-friendly source of protein. “But we can’t get over it,” he says, meaning our squeamishness. Our food decisions are not based purely on intellectual reasoning; for instance, many of us consume meat even though it’s clear most animals were raised in factory settings and didn’t have the best of lives. “If you’re going to come up with a food product, the subtitle might be that it’s good for the environment and good for animals, but if it tastes bad it’s not going to be a success,” says Andras Forgacs, a co-founder of Modern Meadow, which is working on culturing meat, as well as leather. The appeal of these products may also depend on their appearance. Forgacs says he does not intend to produce items that mimic the look of existing meat forms — steak or mince — as this may raise expectations that cannot be satisfied. “You risk falling into this uncanny valley, where it’s not 100 percent like meat. It might be 98 percent like meat, but the 2 percent gap at the end is sufficient to make people feel like it’s not great.” He is focusing on novel incarnations, like chips containing cultured meat. The above story is based on materials provided by Ted Ideas.